recently I've been talking with one of registered users about new features. Specifically about SCSI devices support (ZIP drive, HDD). Is anybody else interested in such a functionality?. I am curious about your suggestions . In any case feel free to post here what you most miss in SMFW30. I have been using your SMFW30 software quite extensively and find it definitely fits my needs. I only have one issue which is minor, but occasionally it's also major. Sometimes when I import 5 or 6 samples, I get one that gets corrupted by the software. It's usually a high pitch sound or simply static. I will then try and re-import that one WAV file and the same thing happens. This means that either the WAV sample is bad, or something in the SMWF30 app is conflicting with it. In any event, I can supply you with an example WAV or two that I cannot get to import if you wanted at some point to test on your own. 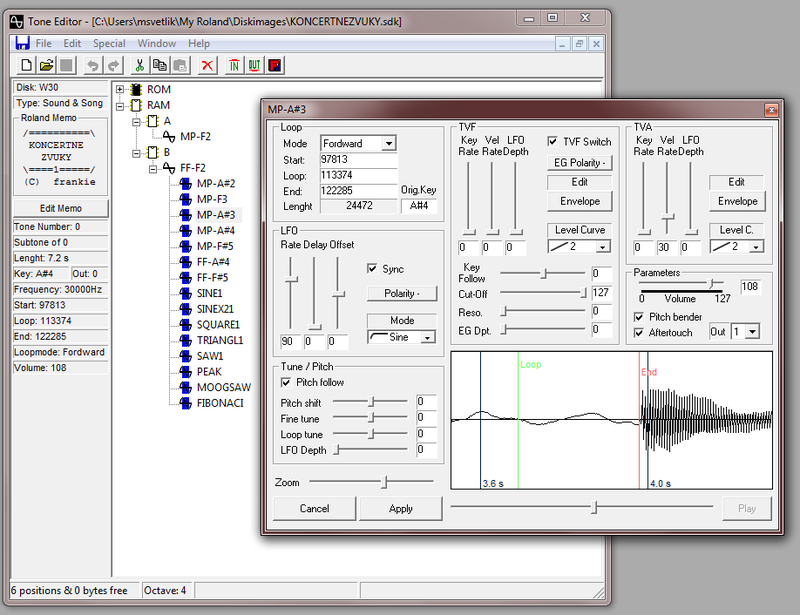 For the most part I can just sample direct, but then I run into issues with input balance and volume. The samples imported via SMFW30 are almost always much more clear and higher in volume. I like this very much, but it's often difficult to reproduce when sampling directly. I'm not sure why. With regards to new features, I would say the following would be great. 1. Allow editing of the "Key" which I almost always have to edit once imported into the W-30. In fact, I noticed that in SMFW30 v2, I can only edit the "Memo" and nothing else. This is fine as I ultimately just need the WAV imported, but I noticed in V1 I can edit just about everything. I use Version 1 to make parameter edits, and then reopen the file to create my OUT file. 2. Allow patch editing like in Version 1, particularly with Volume. I noticed when I import samples, the volume under patch is always at 0. Again, using Version 1 I can edit names, keys, volume, Loopmode etc, but in version 2 I no longer can. Not sure why. 3. Support for SCSI devices would be awesome! Note that I mainly ( and perhaps others ) use ZIP and MO drives only because they are more reliable than HDDs. Plus it's easier to move zip disks around. I would even pay for an upgrade to this no problem at all. Also note that the connecting to a CD-Rom is probably not that necessary due to the fact that may users probably do not have a compatible CD-Rom. In my experience thus far, ZIPS, MOs, and HDDs are the easiest to acquire for the W-30. Despite the occasional corrupt WAV file I get when importing via SMFW30, I have had much success with your software. Thank you!! if you can send me an example of wav files causing the corruption I would be glad to check whats going on . On the topic of direct sampling: You need very good input source (basically quality preamp should do), second problem can be the impedance of source. Impendance is much more difficult to solve. Also I found that sensitivity trimmer of back of W30 is quite dodgy. Try to mess with it for best result, full on doesnt always mean the best signal. About the patch editor I would like to implement it on the simple level but I dont give any guarantee it will make it in the upcoming update. Thank you Jim for your enthusiasm. Thank you very much Miro for the info! I'll take a look. Again great news with possible future updates. Looks great!! With all the hard work you're putting into this, please don't forget to add a "donation" button to your site. Or perhaps there will be an upgrade package. Would love to help support your development when the release date nears.